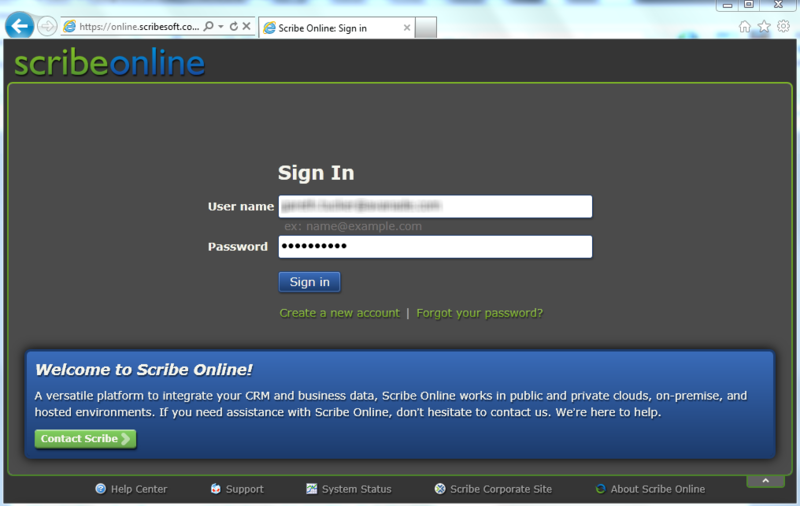 In my last post I shared my first impressions of Scribe Software’s Scribe Online product. In this post I will have a similar look at their other product: Scribe Insight. 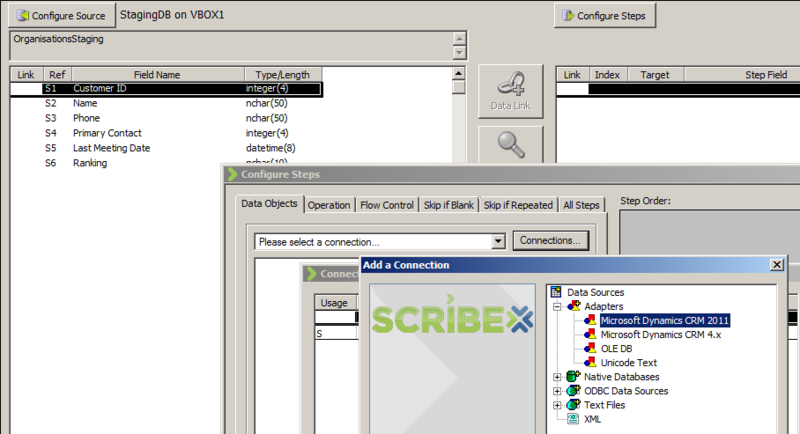 Scribe and their Scribe Insight product have been around for 17 odd years, providing a data migration and integration toolkit for a range of CRM applications. The product has a long history with Microsoft CRM too and is used by a vast number of partners and customers globally. 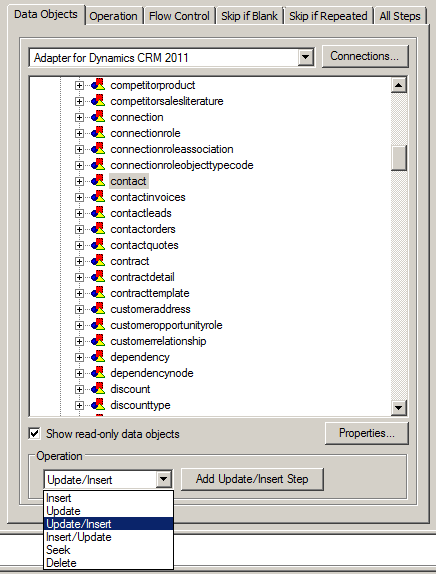 They offer an interesting product that offers an alternative to custom .Net scripting, fitting somewhere in between CRM’s Data Import Wizard and the likes of SSIS, BizTalk and TIBCO. They have licensing options aimed at data migration scenarios where you buy a 60-day license at a discounted price. And they have your normal one-off purchase + annual maintenance license options as well. The installation experience was much like any other product. You have the Scribe Insight product to install and then each Adaptor that you wish to use. 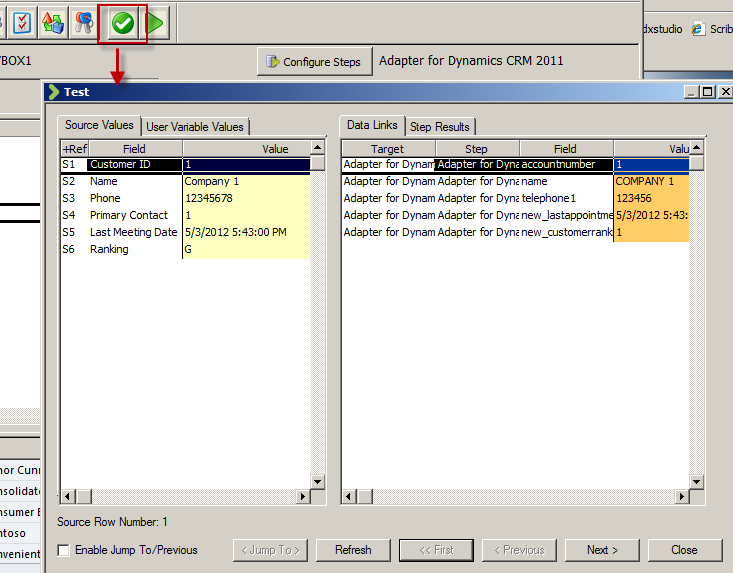 I went ahead and installed the Microsoft CRM 2011 Adaptor. Its these Adaptors that make Scribe attractive. They take away the need to learn the specifics of a system’s database schema or APIs, you just have to map your data to the fields the Adaptor surfaces and it takes care of uploading your data and takes responsibility for maintaining the integrity of the database. 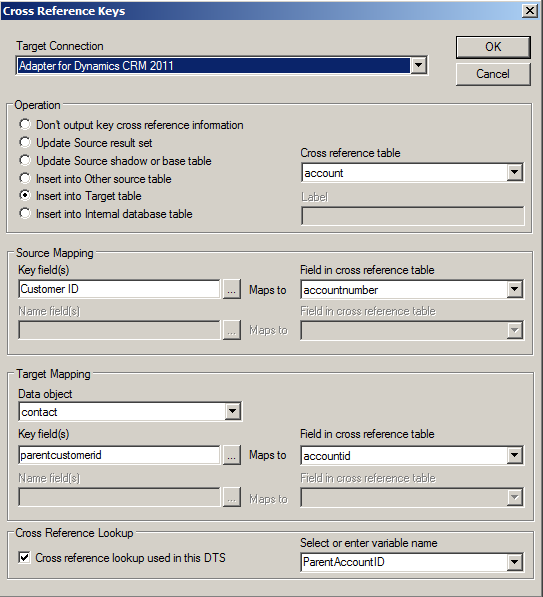 Ok, let’s work through a data migration scenario. 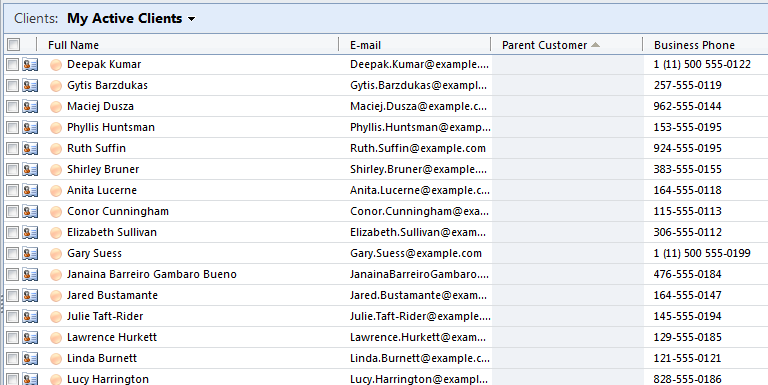 I have a source system that contains Contact and Account records and I want to load those into my lovely new Microsoft CRM system. Each of my Contacts is parented by an Account and each Account also has a Primary Contact. So, I’m going to have give my data migration sequencing a little thought. 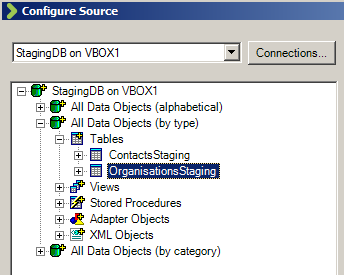 I get the data out of my source system and load it into a pair of staging tables in SQL Server. Now, if my source system was Salesforce.com or Goldmine or something like that I could have used one of Scribe’s adaptors and skipped the need to extract to a staging db. 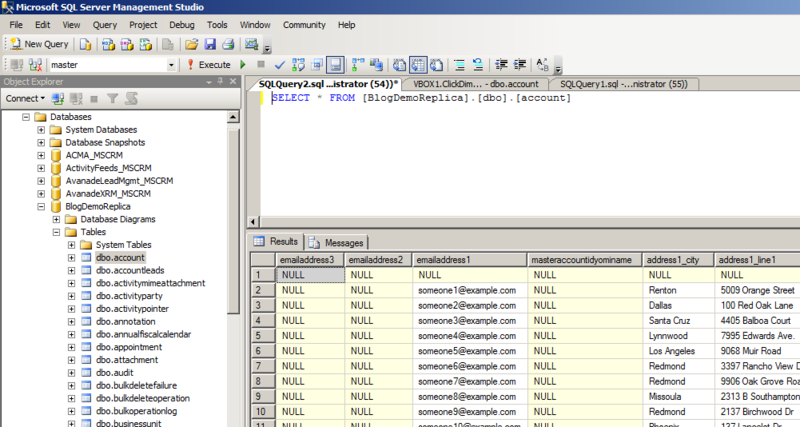 But for this exercise I will just use SQL as my source. I repeat for each field, except for the Primary Contact field. 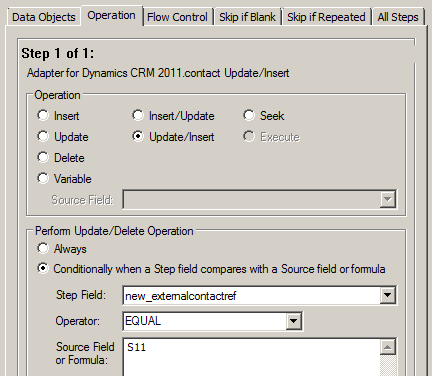 I will need to come back and update the field later once I have migrated the Contacts. Now, one of my fields requires a bit of transformation on the way through. 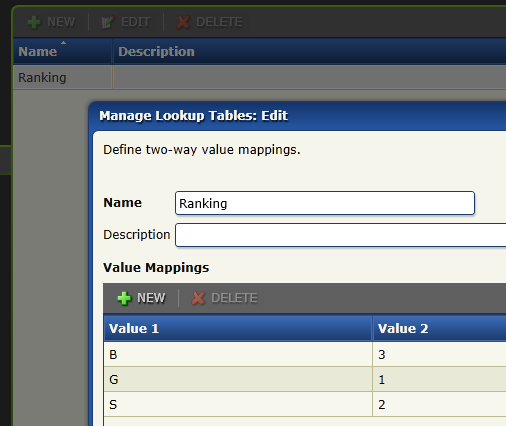 My Customer Ranking field is a pick list in CRM with options ‘Gold’, ‘Silver’ and ‘Bronze’ and with underlying database values of 1, 2 and 3. But back in my source system these rankings are stored as G, S and B. My preference in a scenario like this would be to perform this transformation in the staging database with SQL scripts rather than mucking around with transformation in a migration tool. But you can’t always do this (e.g. 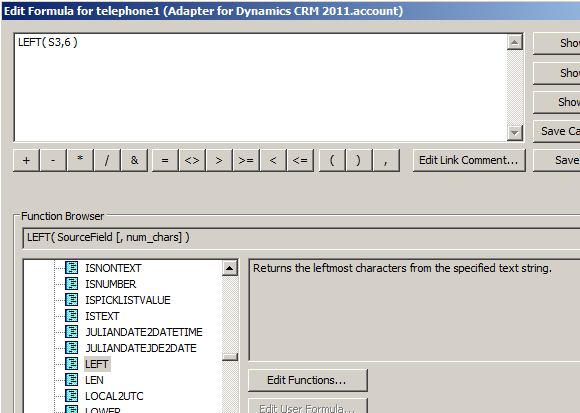 when migrating directly from a source system) so let’s see how Scribe addresses on-the-fly transformations. There’s a bit more to the configuration but that gives you a feel for the process. 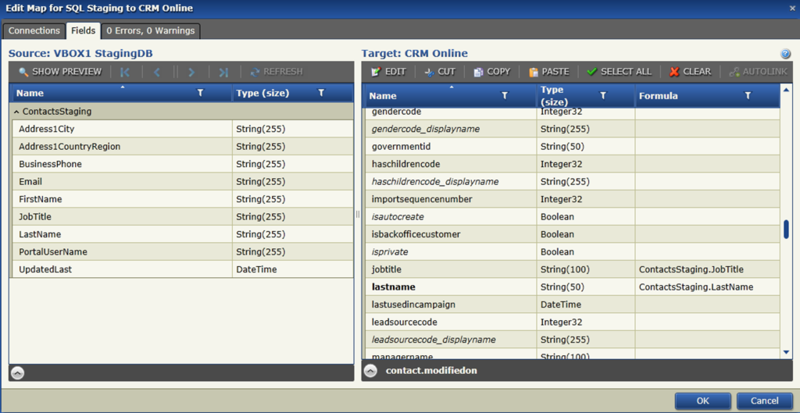 Now that I have my Accounts successfully migrated into my CRM system I can now load my Contacts. 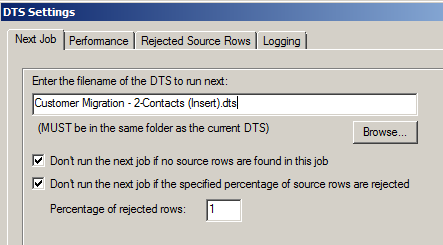 I save the Account migration definition (Scribe calls it a “DTS”) and then click the New button to start a new definition (you have to create a new DTS for each source entity/table). I go ahead and repeat most of the same steps I just went through for Accounts. I then get to the point where I need to figure out how to handle the Customer ID (Parent Account) field. 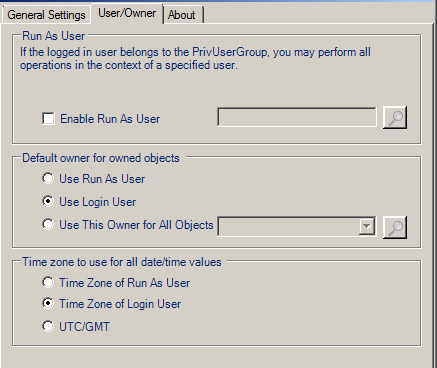 Now my source system had its own unique IDs for Accounts and its this value that’s stored on each Contact in my source data to provide the link between each Contact and its parent Account. 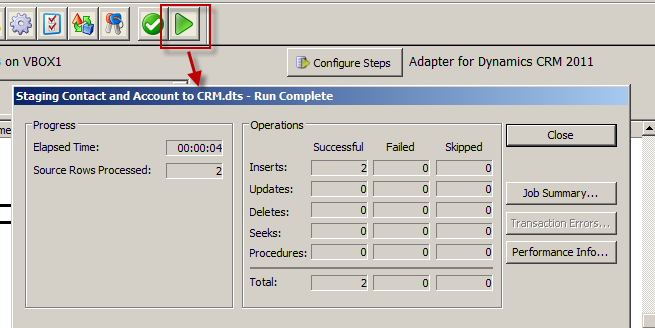 CRM has its own unique key of course (the GUID) but to support this migration I made sure I loaded the source system’s unique key into CRM when I uploaded my Accounts. 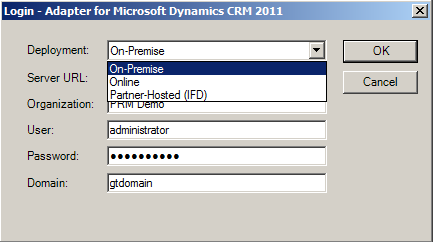 I pushed that “Customer ID” field into the Account entity’s “Account Number” field (a spare field I had available in CRM). To be honest, I find this next bit fairly confusing. I did get it to work though so I think it might just be bad terminology. Let me try and explain. What we need to do is change this formula and have the destination field get its value from a “Cross Reference Key” rather than directly from the source field. That means we need to create a Cross Reference Key that will translate the source system’s “Customer ID” into a CRM Account GUID. 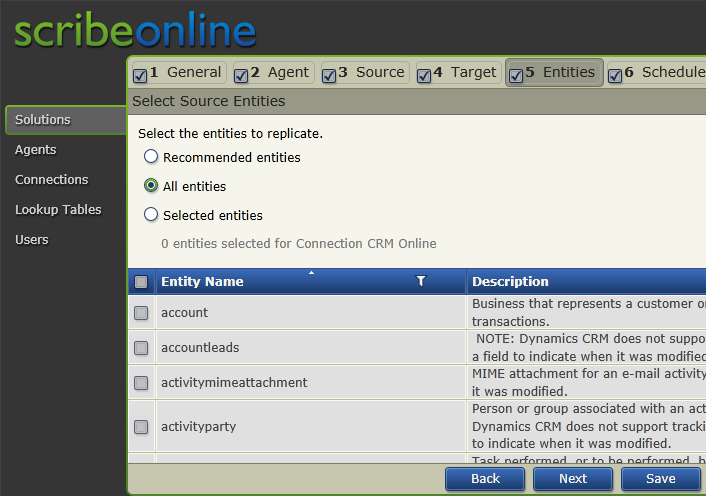 Now rather than referring to a cross reference table in Scribe’s Internal database like we did for the pick list mapping – we instead point Scribe at CRM for the necessary mapping. 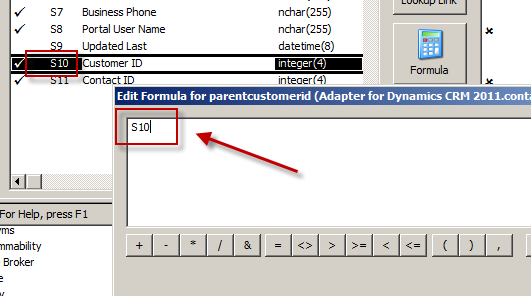 The mapping is there for us in the Account table: the Account records I imported each have a GUID and they also have the “Customer ID” unique key from the source system sitting in the Account Number field. We’re 2 thirds of the way there. 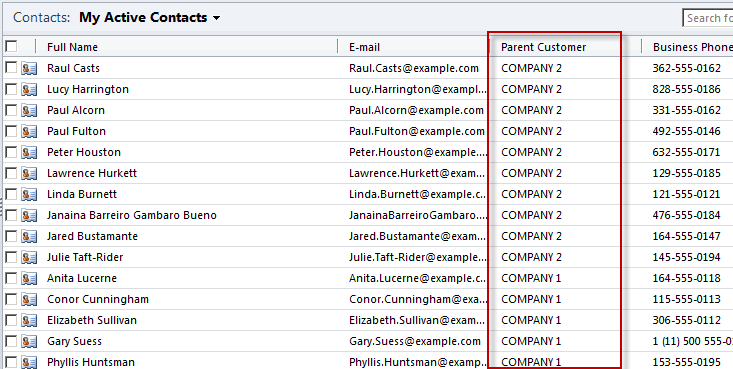 We’ve loaded the Accounts and Contact and linked each Contact to its parent Account. 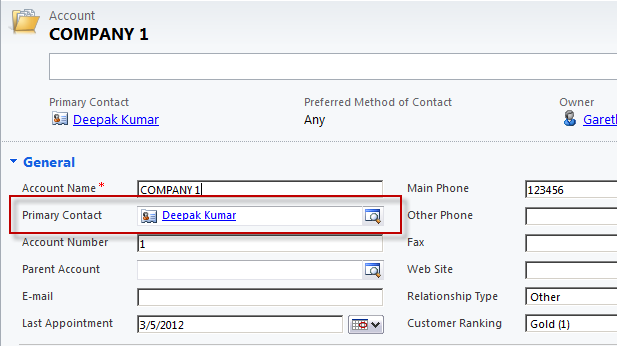 Now, we need to go back and populate the Primary Contact field on the Account records that we omitted earlier. 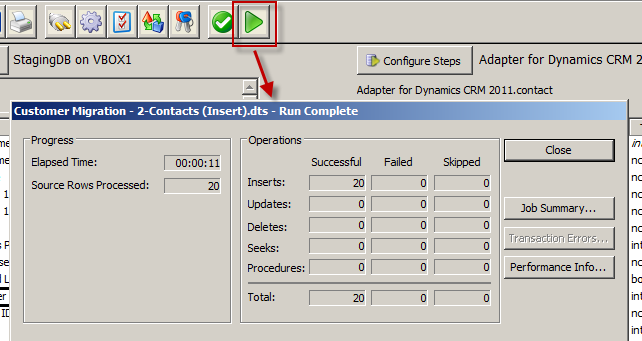 We had to omit it because the Contacts didn’t exist in CRM at the point in time we were creating the Accounts. It was a crazy chicken and egg Dr Who Timecop John Connor paradox thing. So, we need to re-run the Account records from our source system back through Scribe and run an update. This tells Scribe that wherever these 2 fields match it should do an update. 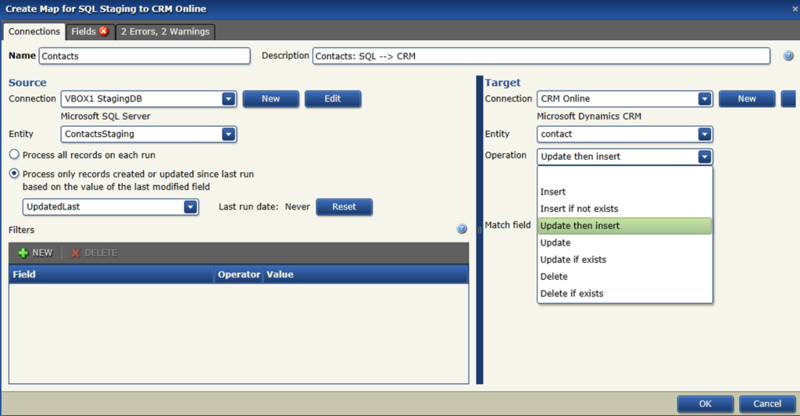 Next, we create a data link between the “Primary Contact” field in the source system and the “primarycontactid” field in the destination system. This link will of course require transformation so another Cross Reference Key will be required. 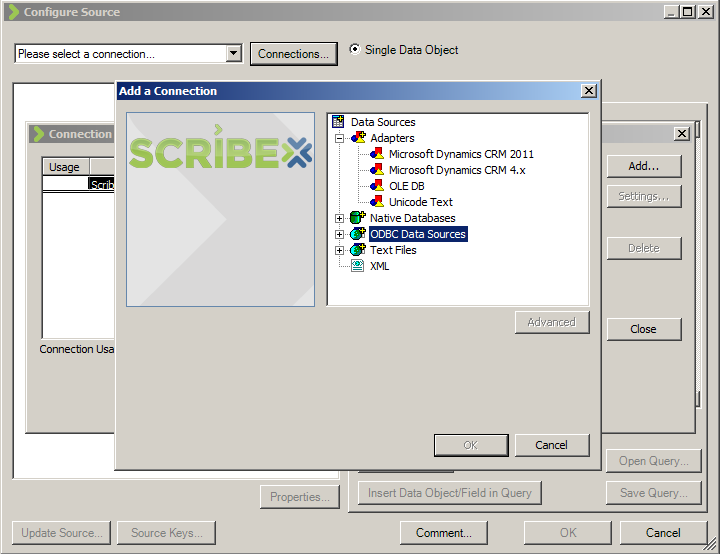 There you have it, a fairly comprehensive introduction to Scribe Insight as a Data Migration tool for Microsoft CRM. If you have any experiences to share or have found this useful please leave a comment below. 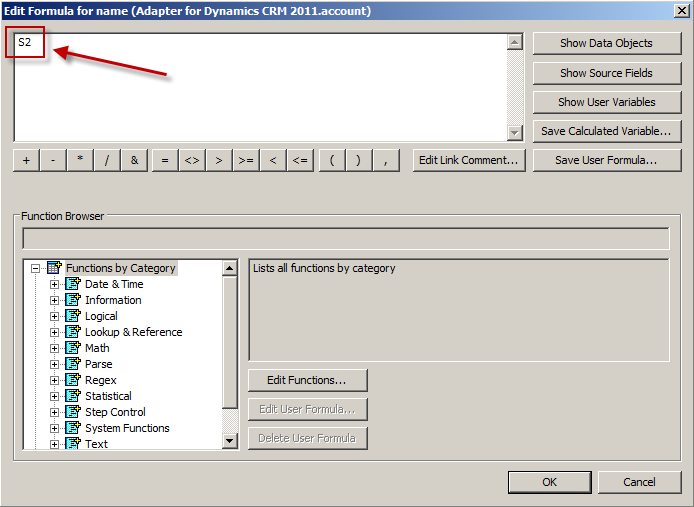 This entry was posted in Uncategorized and tagged CRM 2011, Scribe on May 6, 2012 by Gareth Tucker. 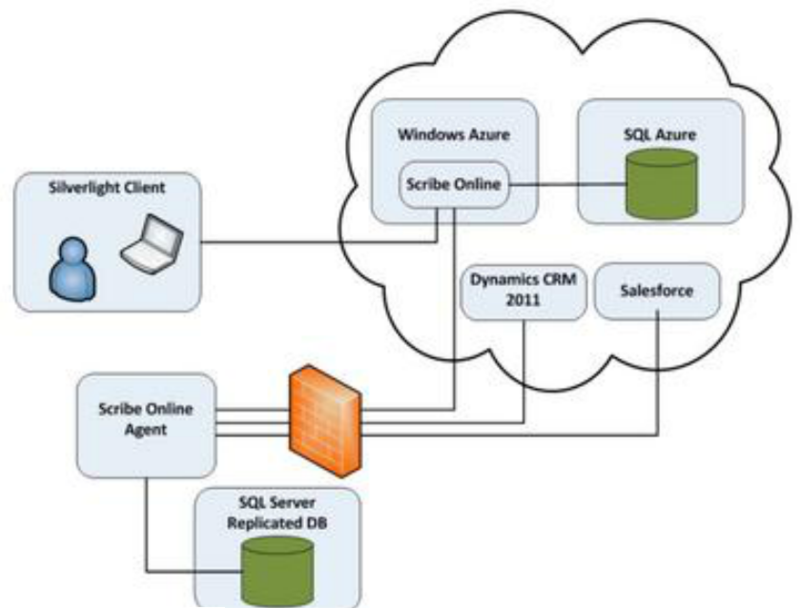 Scribe Software has historically been a strong player in the Microsoft CRM space, offering a configuration-based, no-code solution to both data migration and integration requirements. 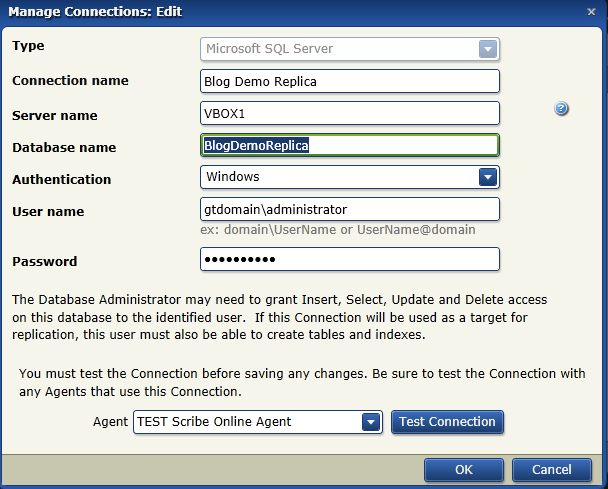 In this post I have a look at their newer hosted offering: Scribe Online – where from $99 USD / month (and up) you can rent solutions for replication, data migration or integration. This post will give you an overview of the installation experience, introduce you to the configuration process and demonstrate just how easy it is to get up and running very quickly. I was quite impressed by my first taste of this offering and would certainly table it as a potential solution in certain customer scenarios. The emergence of hosted CRM offerings gave rise to a new need that Scribe’s Replication Services product was introduced to meet. 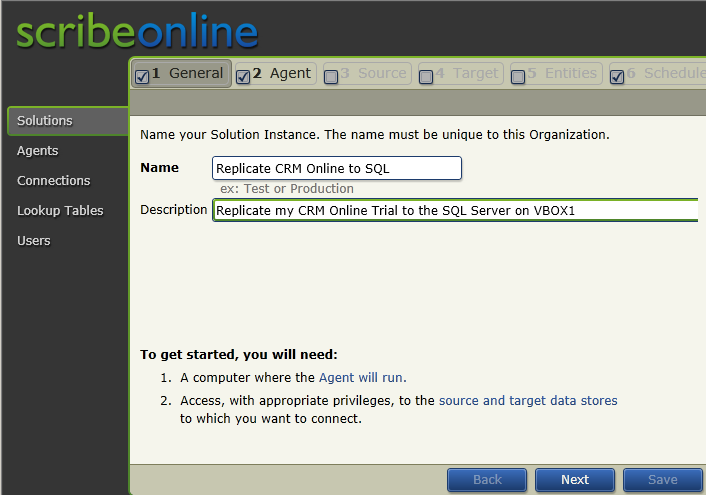 Scribe’s Replication Services allows you to mirror your hosted CRM database down to a local SQL Server database. 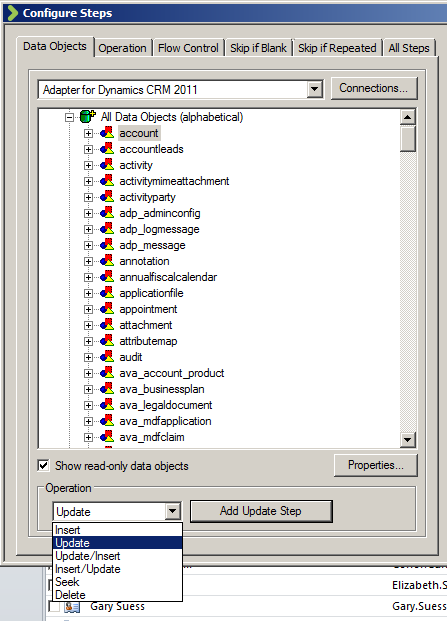 This opens up ‘SQL as source’ reporting approaches and integration options. It is very easy to setup, inexpensive to license and suitably robust. Think how much easier some requirements can be met when you can do a simple SQL read rather than having too muck around writing web service calls. 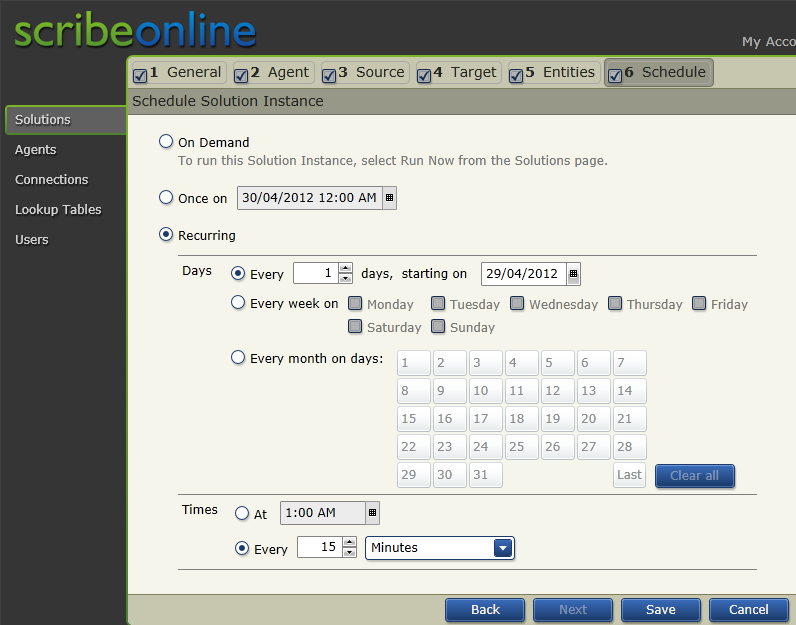 Scribe’s Synchronisation Services offers similar functionality to the Scribe Insights product. It supports one off data migration scenarios and on-going integration scenarios with Microsoft CRM as either Source or Destination system. 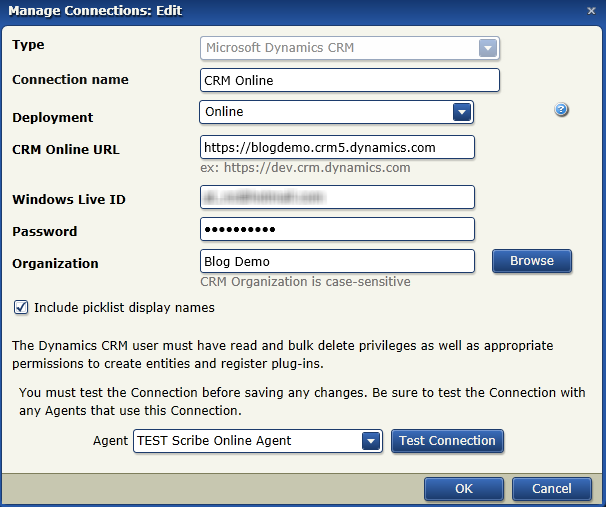 Again it’s Scribe hosted, and again it provides support for CRM Online but is equally suitable for an on premise installation of CRM. I’ll keep this brief, I just want to give you a feel for the process. Scribe offers 14 day free trials from their website for the Scribe Online products so you can easily get your hands dirty. 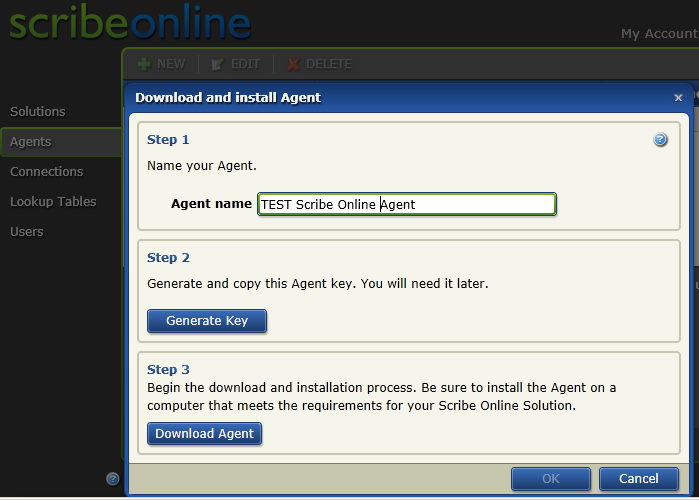 Now, you do need to install a local Agent in order to use Scribe Online, so it’s not 100% SAS. The Agent is required for connection to the source and destination systems. It’s installed as a Service. 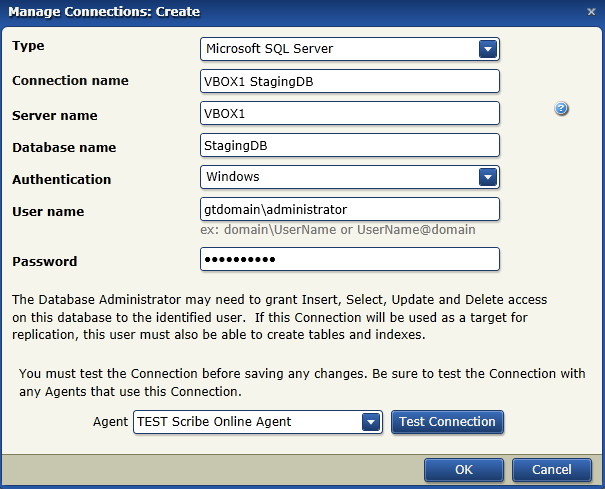 You select the Agent that you installed earlier and then provide the connection details to your CRM Organisation and to your SQL Server database. To keep the replication going and your local database up to date the only trick is to make sure your Agent Service remains running and make sure you set your schedule correctly. 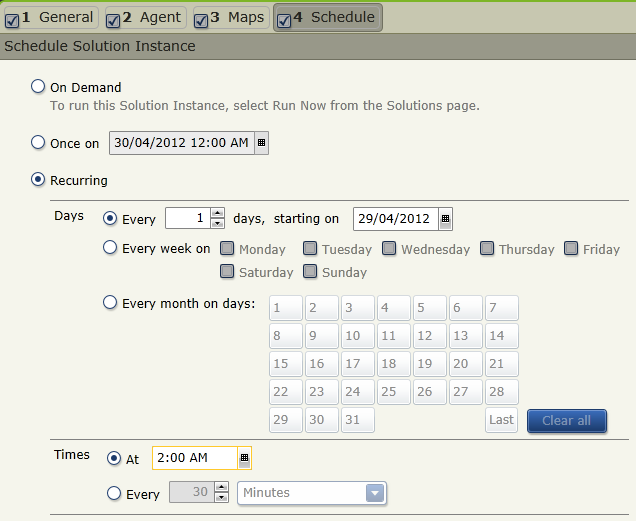 And if your Agent Service stops running for a period of time Scribe Online will send you an email to let you know. As at May 2012 the advertised price for Scribe Online Replication Services is $99 USD / month, with an upper limit of 175 million records replicated per annum. The pricing goes up in step increments from there to e.g. : $475 for 1 billion records. 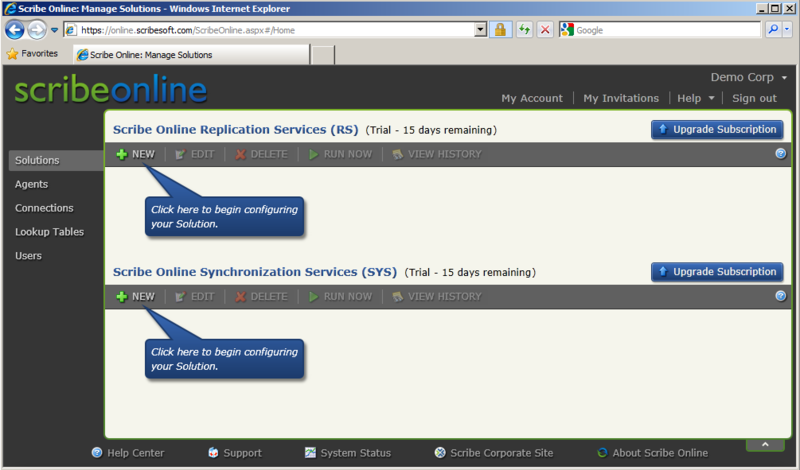 The Synchronisation Services is Scribe Online’s integration and data migration engine. You pick the Agent you wish to use and then define at least 1 Map records. A Map is required for each source-destination table combination. 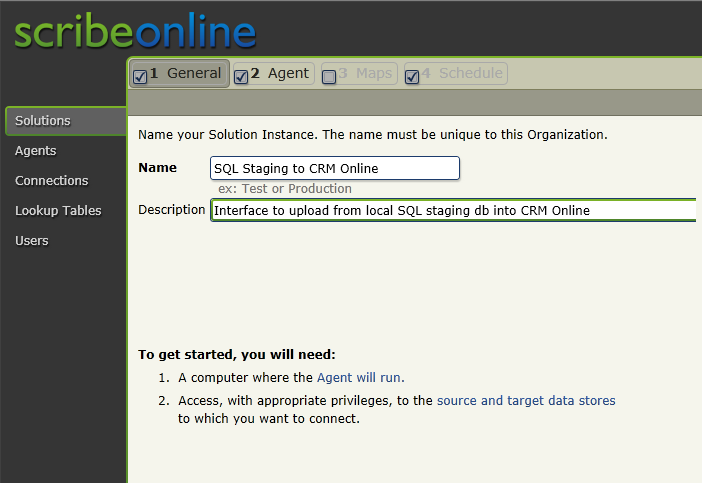 For this demo I am going to map a local SQL staging database’s table of Contact records to the CRM Contacts entity (but I could be reading those source records from a text file or other ODBC/OLE DB source). And that’s it. I can wait for the schedule to kick off the synchronisation or I can run it manually. That gives you a feel for what a one-off data migration would be like. My solution was created with integration in mind though. I configured a unique key between my source and destination systems and informed Scribe how I wanted it handle updates vs. inserts. 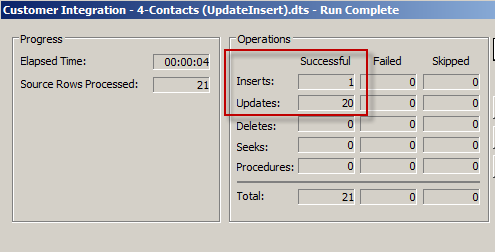 I’ve also told Scribe to refer to the ‘UpdatedLast’ date field in my source table when performing subsequent synchronisations so that it only bothers to process records where that field is ahead of the last run date (indicating a recent change). 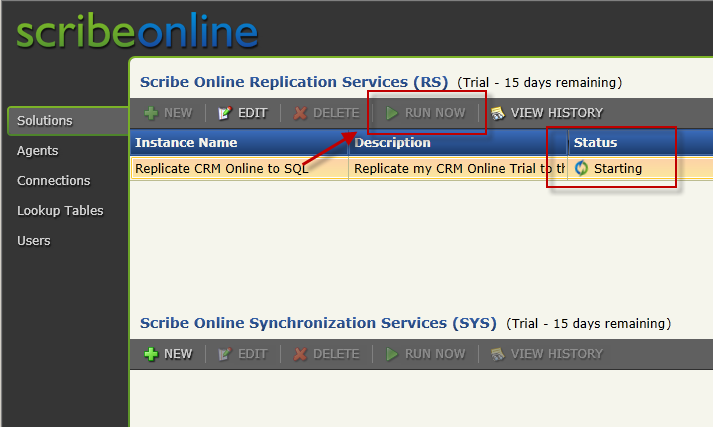 There you go, a quick run through on the basics of Scribe Online Synchronisation services. I must say I found the whole experience very intuitive and robust. The user interface and the end-to-end configuration user experience speaks volumes for the maturity of Scribe’s development processes and quality of their application architecture. As at May 2012 the advertised price for Scribe Online Synchronisation Services is $99 USD / month, with an upper limit of 1.5 million records processed per annum. The pricing goes up in step increments from there to e.g. : $1000 for 100 million records. Unlike with their Scribe Insight product there is no 60 day license option here to support migration scenarios - the minimum term is 12 months. But still, $99 x 12 is not a huge outlay. Something to consider. Update: Since writing this post I have had a look at Scribe Insight, Scribe’s traditional on-premise solution for Integration and Migration. You can read all about that here. Scribe Online’s Synchronisation services is definitely a more pleasant user interface to be working in but you also lose a lot of functionality compared to that available with Scribe Insight. And then when I map my source and destination fields I add a Lookup formula that references this table (similar to doing a vlookup in Excel). I’d like to show you a screenshot now but my Scribe Online has decided to stop working. It’s driving me mad just at the moment to be honest. Anyway, to link the Contacts to their parent Account records there is another type of Lookup formula available which will essentially do a vlookup into your target system. So, the capability looks to all be there. Please feel free to share your experience and opinions via the comments below. 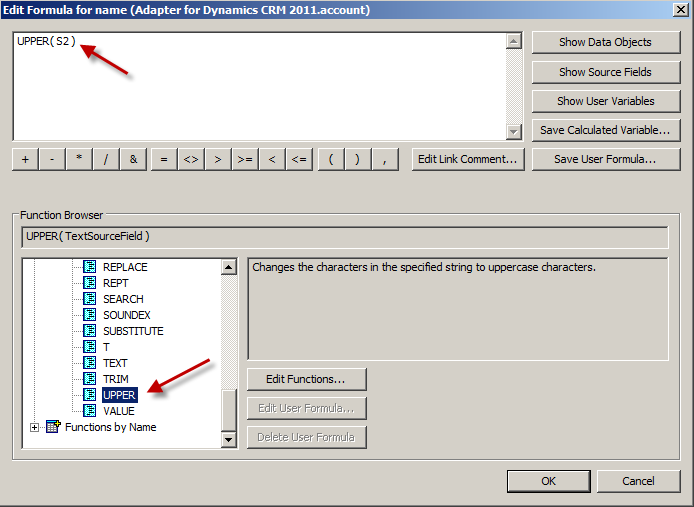 This entry was posted in Uncategorized and tagged CRM 2011, Scribe on April 29, 2012 by Gareth Tucker.